About Miracle Leaf Health Centers - South Beach Bringing wellness to patients using cannabis as treatment for a variety of ailments, symptoms and illnesses. For qualifying medical patients in Florida, we are their initial and ongoing access to a qualified physician who recommends them for medical cannabis treatment. Miracle Leaf also engages in the sale of pharmacist formulated, doctor recommended CBD products that are available for purchase by all. 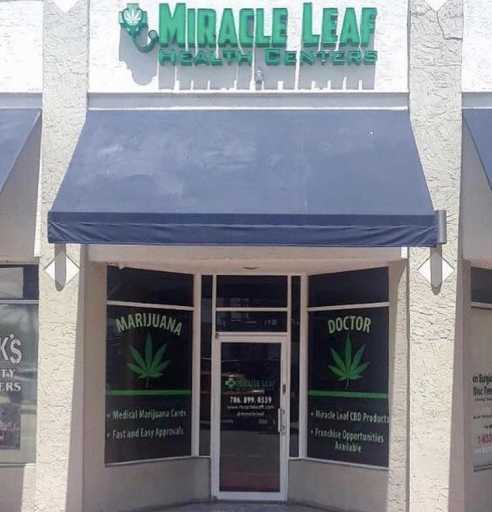 Miracle Leaf Health Centers - (South Beach) was established in 2018. Capitalizing on years of experience in medical marijuana our purpose is to provide patients with professional, personalized, and competent medical cannabis treatment to meet their needs with Earth’s Miracle Leaf. Opportunity Owning a Miracle Leaf provides you an opportunity to partner with an industry leader in a highly competitive industry whose sales grow more and more quarterly.. Do not let the competitive nature of the industry stifle you. Our concept is unlike any other. We have geared our company to provide you with knowledge, support and training that will allow you to effectively meet and surpass any consumer expectations. Offerings Miracle Leaf offers a comprehensive and hands on training program in order to ensure that you are 100% equipped with the knowledge, skills and expertise to successfully operate this center. Our multi-phase training includes hours of hands on training covering all the facets of the industry (including but not limited to patient/doctor sequence, product knowledge, software integration and use, legal and medical support) at one of our corporate locations in addition to many hours of ongoing support at your newly established location, ensuring your business progresses and quickly as the rest of the team. Backed by an enormous and growing body of scientific research, progressive cannabis laws, and enthusiastic public opinion, cannabis access is the beginning of a patient’s journey to cannabis as a groundbreaking health solution. •	89% Percent of Americans support the legalization of marijuana for medical treatment if prescribed/recommended by a Physician. In 2011, that percent was at 74 %. Attitudes toward marijuana use increase every year. •	69% Percent of physicians support nationwide legalization of medical cannabis, according to a survey by webMD/Medscape. As acceptance by the medical community snowballs, physicians are petitioning to open quality testing labs, marijuana clinics, and other businesses. Industry -- SOLD--$7.1B Is the estimated size of the legal U.S. marijuana industry (both medical and recreational) in 2016 – a boost of more than 25% over the year 2015. This substantial increase is linked to massive growth in Colorado, Washington, Oregon and other states approving both medical and recreational use. Why Choose Miracle Leaf? Miracle Leaf has simplified the process of receiving a qualified patient status and marijuana registration in three easy steps: •	Doctor Evaluation - To obtain a Florida Medical Marijuana Card, a patient must first be evaluated and recommended medical marijuana by a licensed and qualified doctor in Florida. •	Apply for the Florida Marijuana Card Registry - Once a Doctor recommends cannabis to a patient, the next step is to enroll the patient into the Florida Marijuana Card Registry Program. The process is simple and we assist patients with expediting the State application for quick approval. •	Receive Florida Marijuana Card - Once registered, a patient holding a valid Florida Medical Marijuana Card will be able to legally obtain their medical marijuana at licensed dispensaries. Card holding patients are legally able to possess and use medical marijuana in Florida. •	CBD Products Available To All - Pharmacist formulated, doctor recommended Miracle Leaf branded CBD line offers patients and non patients alike medicine that is unlike any other product available over the counter. Quarterly, third party testing ensure our standard of quality is always met and we continue to hold our place as the industry leader in Florida.